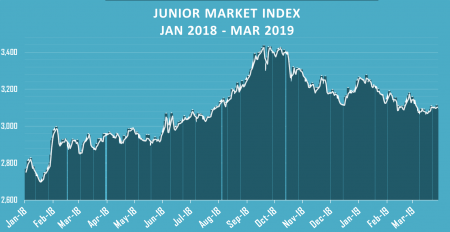 The Junior market is down 4.8% for 2019 but the chart is flashing some positives. 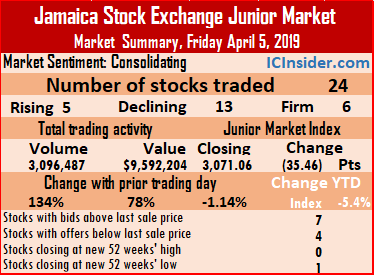 The Junior Market closed the first quarter of the year with a decline of 4.8 percent but technical indicators suggest that a major change is coming soon, with the early signals suggesting it could be to the upside. 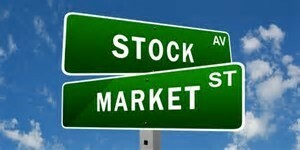 The market index declined 20.30 points to 3,092.02 as the prices of 9 securities rose, 10 declined and 10 remained unchanged. At the close of trading, 29 securities changed hands, versus 28 Thursday. 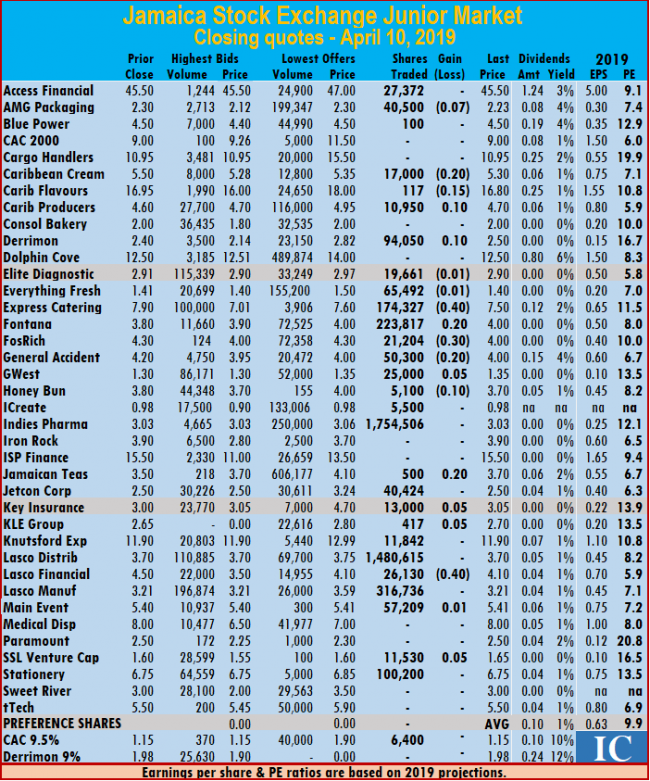 Market activities, was more normal on Friday from Thursday swollen volume, with a 70 percent drop in the day’s volume, to 3,378,621 units for $15,299,931, compared to 11,336,686 units changing hands at $37,683,562 on Thursday. Trading ended with an average of 116,504 units for an average of $527,584 in contrast to 404,882 units for an average of $1,345,842 on Thursday. 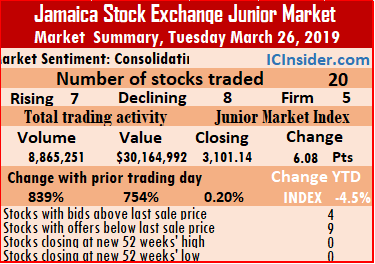 The average volume and value for the month to date amounts to 195,942 shares valued at $777,498 compared to 200,568 shares valued at $792,051 on the previous day. In contrast, February closed with an average of 235,225 units valued at $679,790 for each security traded. IC bid-offer Indicator| At the end of trading, the Investor’s Choice bid-offer indicator reading shows 6 stocks ended with bids higher than their last selling prices and 6 with lower offers. 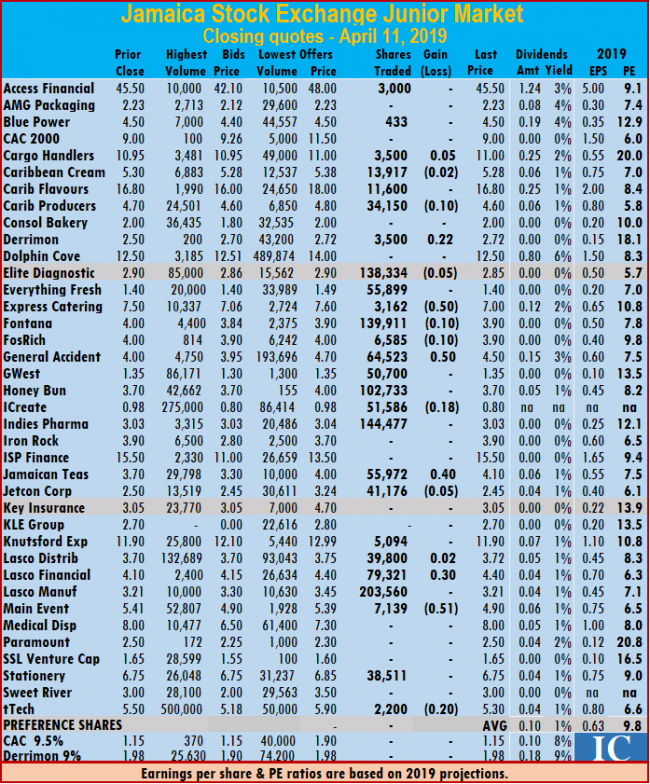 At the close of the market, Access Financial closed with a loss of 60 cents at $46, with 1,000 shares changing hands, AMG Packaging ended with a loss of 10 cents at $2.15, exchanging 2,150 stock units, Blue Power concluded trading with 5,618 units at $4.60, CAC 2000 finished at $12, with 8,000 shares trading. Cargo Handlers settled with a loss of $1.94 at $11.06, with 354,500 shares changing hand, Caribbean Cream ended trading with 2,000 shares, 1 cent higher at $5.55, Caribbean Flavours traded 10,000 stock units 5 cents higher at $17.10, Caribbean Producers rose 17 cents to close at $4.77, with an exchange of 36,500 units. Derrimon Trading ended with a loss of 9 cents at $2.65, with an exchange of 30,400 shares. 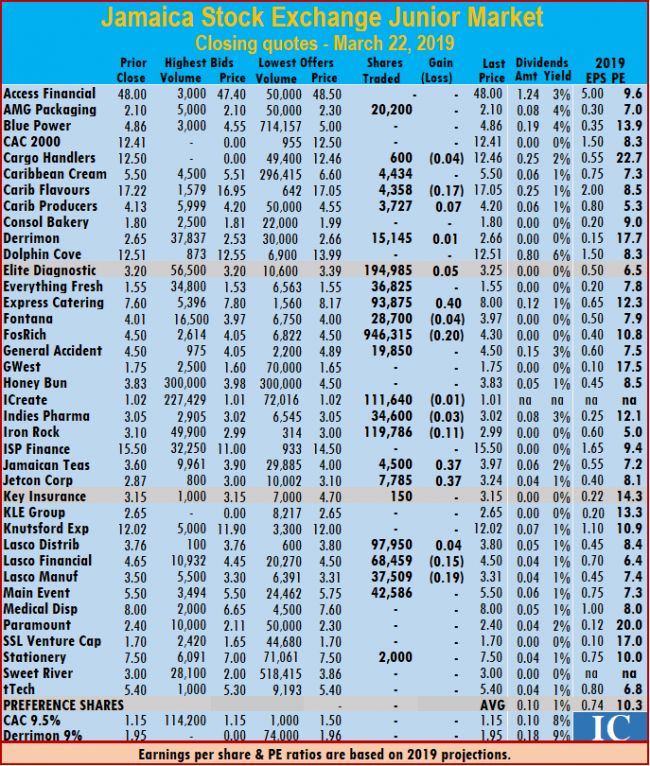 Everything Fresh finished at $1.51, with 3,000 stock units changing hands, Elite Diagnostic settled at $3, trading 10,000 units, Express Catering ended trading 20,152 shares, with a loss of 20 cents at $7.60, FosRich Group closed at $4, with 20,000 shares changing hands. Fontana finished trading 199,144 shares, at $4.05, General Accident closed 49 cents higher at $4.50, with 9,200 stock units changing hands, GWest Corporation ended with a loss of 5 cents at $1.40, in exchanging 10,000 units, Honey Bun concluded trading of 324 shares with a loss of 1 cent to close at $4.24. 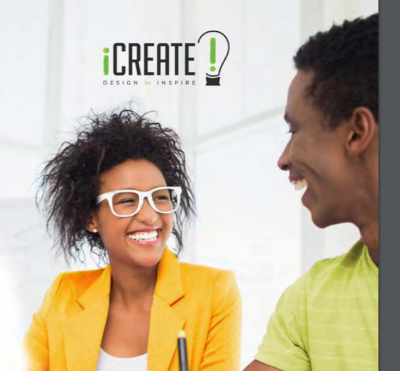 iCreate added 1 cent to close at $1.01, with an exchange of 29,400 shares, Indies Pharma finished at $3.09, with 1,946,580 shares changing hands, Iron Rock settled 44 cents higher at $3.99, with an exchange of 750 shares, Jamaican Teas traded 1,800 units to close at $3.90. Jetcon Corporation finished trading 5,865 shares with a loss of 20 cents to close at $2.80. 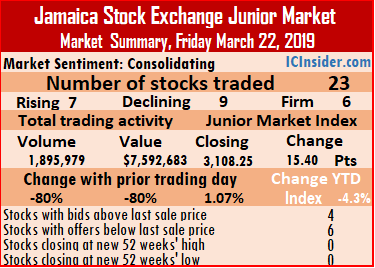 Knutsford Express closed 80 cents higher to $12.70, with 112,159 stock units changing hands, Lasco Distributors finished with a loss of 4 cents at $3.85, exchanging 55,627 units, Lasco Financial settled with a loss of 5 cents at $4.50, with an exchange 145,483 shares, Lasco Manufacturing ended trading 187,738 shares with a rise of 30 cents to $3.60. Main Event traded 1 cent higher at $5.51, with 4,700 shares, Paramount Trading closed at $2.30, with the trading of 160,106 units and tTech settled at $6, with 6,425 stock units changing hands. 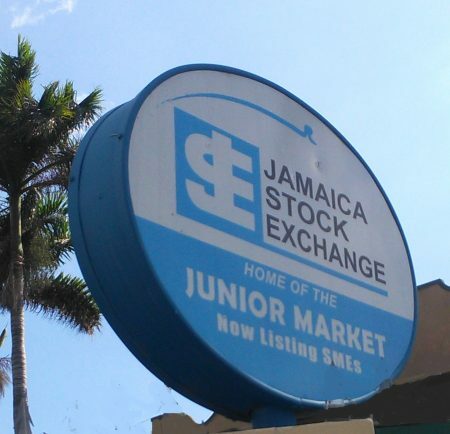 Trading on the Junior Market of the Jamaica Stock Exchange jumped 839 percent on Tuesday, with 8,865,251 units valued at $30,164,992, up from just 944,033 units valued at $3,531,740 changing hands on Monday. Indies Pharma accounted for 7.3 million units of the shares trading on Tuesday. At the close of trading, 20 securities changed hands, compared with 27 on Monday. The market index gained 6.08 points to close at 3,101.14 as the prices of 7 securities rose, 8 declined and 5 remained unchanged. Closing bids and offers are reflecting negative out turn for stocks in Wednesday’s trading as indicated by the negative Investor’s Choice bid-offer indicator. Trading ended with an average of 443,263 units for an average of $1,508,250 in contrast to 34,964 units for an average of $130,805 on Monday. The average volume and value for the month to date amounts to 185,926 shares valued at $750,760 compared to 173,730 shares valued at $714,860 on the previous day. In contrast, February closed with an average of 235,225 units valued at $679,790 for each security traded. IC bid-offer Indicator| At the end of trading, the Investor’s Choice bid-offer indicator reading shows 4 stocks ended with bids higher than their last selling prices and 9 with lower offers. At the close of the market, Blue Power concluded trading of 18,797 shares with a loss of 10 cents, to end at $4.60, Caribbean Flavours traded 18,871 stock units, at $17.05, Caribbean Producers fell 19 cents to close at $4.21, with 10,900 units changing hands. Derrimon Trading ended with a loss of 35 cents at $2.30, with an exchange of 266,450 shares, Dolphin Cove jumped $1.48 to $13.99, with the trading of 314 shares. 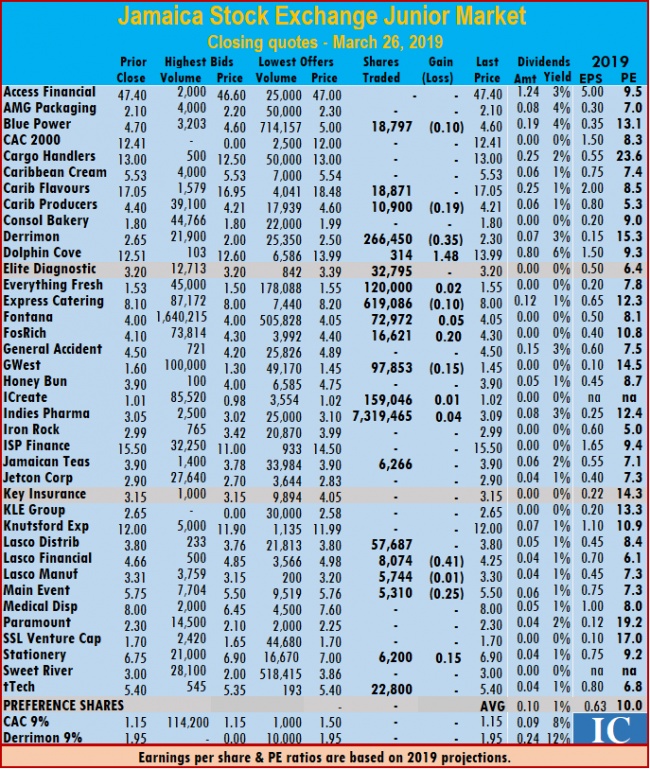 Everything Fresh finished 2 cents higher at $1.55, with 120,000 stock units trading, Elite Diagnostic settled at $3.20, with 32,795 units changing hands, Express Catering ended trading 619,086 shares, with a loss of 10 cents at $8, FosRich Group traded 16,621 shares, 20 cents higher at $4.30. 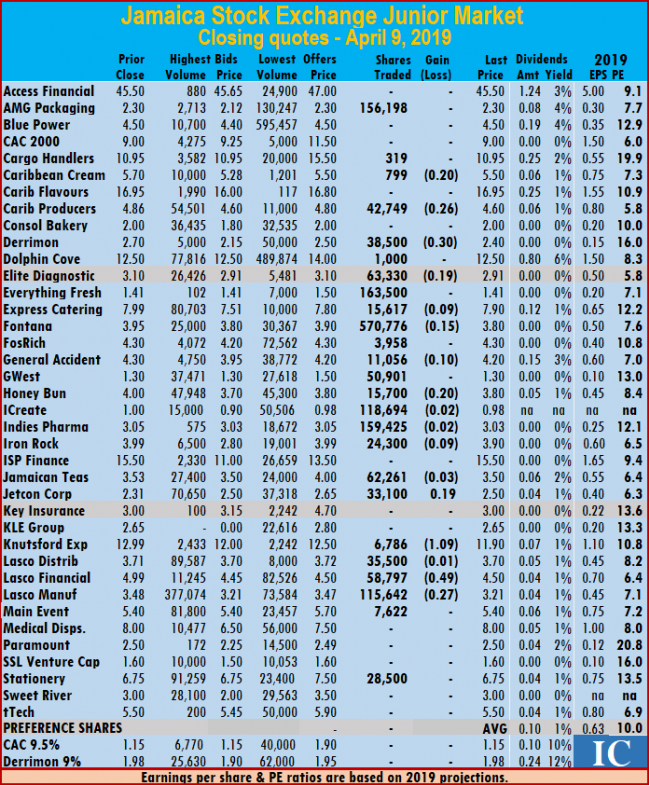 Fontana ended trading 72,972 shares after rising 5 cents to $4.05, GWest Corporation ended with a loss of 15 cents at $1.45, with 97,853 units trading, iCreate rose 1 cent and closed market activity at $1.02, with an exchange of 159,046 shares, Indies Pharma finished 4 cents higher at $3.09, in trading 7,319,465 shares, Jamaican Teas swapped 6,266 units at $3.90. 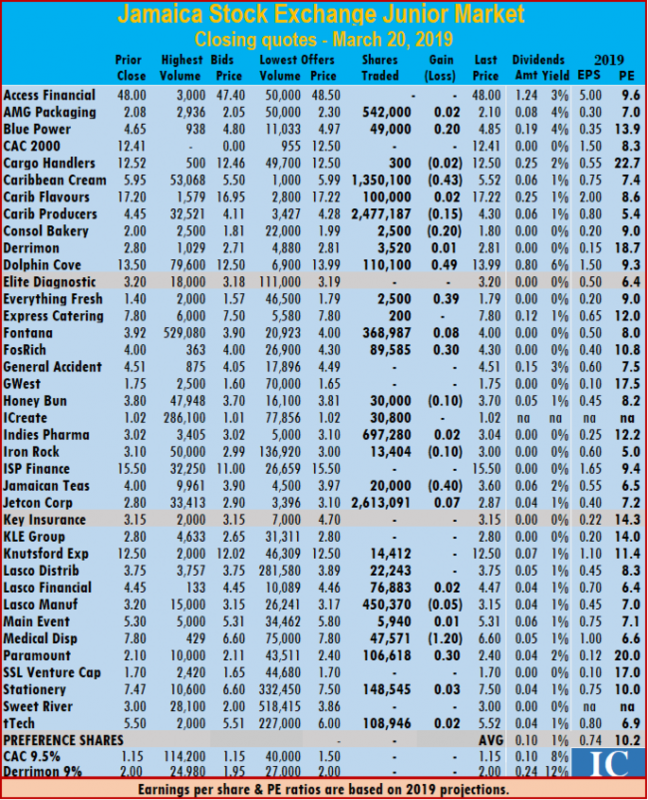 Lasco Distributors finished at $3.80, with 57,687 units changing hands, Lasco Financial settled with a loss of 41 cents at $4.25, with an exchange of 8,074 shares, Lasco Manufacturing ended trading with 5,744 shares and lost 1 cent to end at $3.30, Main Event fell 25 cents to close at $5.50, with 5,310 shares trading. Stationery and Office concluded trading with 6,200 shares after rising 15 cents higher to $6.90 and tTech settled at $5.40, with 22,800 stock units changing hands. 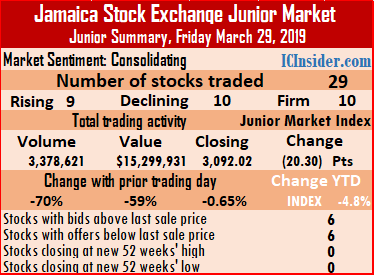 The Junior Market of the Jamaica Stock Exchange index rose on Friday, 1,895,979 units valued at $7,592,683traded, down sharply from 3,232,801 units valued at $12,857,715 changing hands on Thursday. 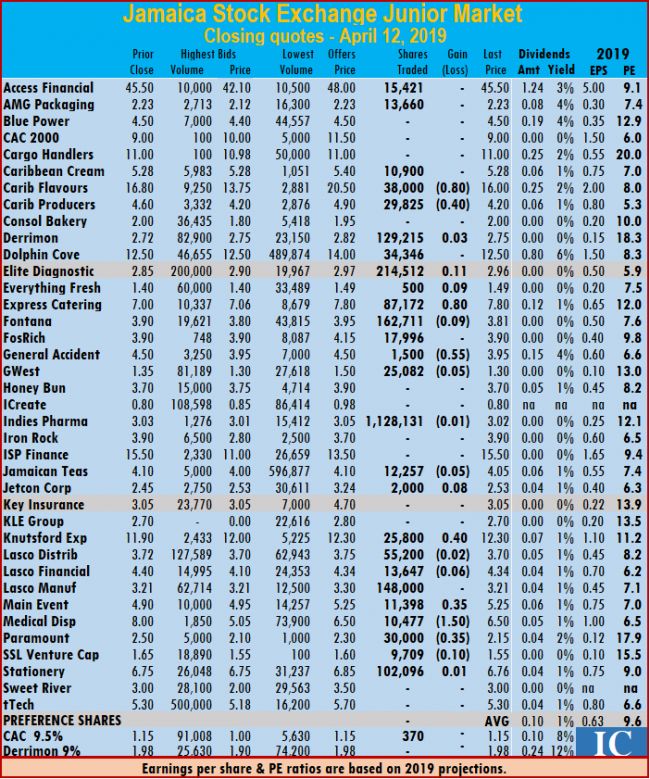 At the close of trading, 23 securities changed hands, compared with 27 on Thursday. 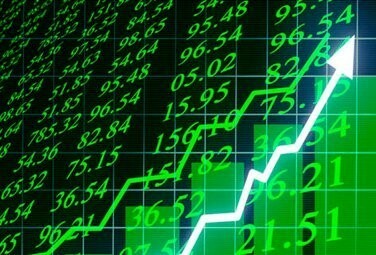 The market index rose 15.40 points to close at 3,108.25 as the prices of 7 securities rose, 9 declined and 7 remained unchanged. Trading ended with an average of 82,434 units for an average of $330,117 in contrast to 119,733 units for an average of $476,212 on Thursday. 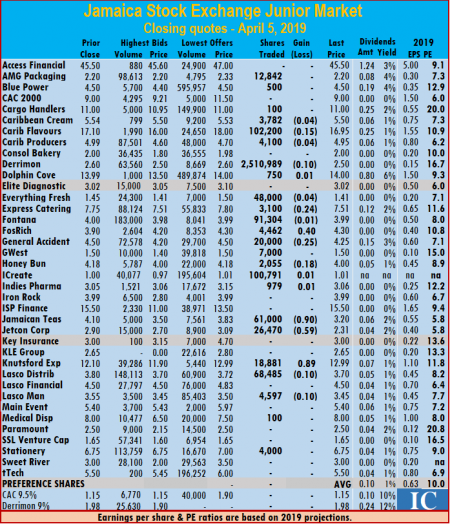 The average volume and value for the month to date amounts to 183,215 shares valued at $$754,782 compared to 222,952 shares valued at $789,131 on the previous day. In contrast, February closed with an average of 235,225 units valued at $679,790 for each security traded. IC bid-offer Indicator| At the end of trading, the Investor’s Choice bid-offer indicator reading shows 4 stocks ended with bids higher than their last selling prices and 6 with lower offers. At the close of the market, AMG Packaging ended at $2.10, trading 20,200 stock units ,Cargo Handlers settled with a loss of 4 cents at $12.46, with 600 shares changing hands, Caribbean Cream ended trading of 4,434 shares at $5.50, Caribbean Flavours traded 4,358 stock units, with a loss of 17 cents at $17.05. 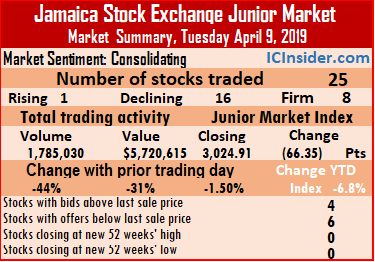 Caribbean Producers finished 7 cents higher at $4.20, with an exchange of 3,727 units, Derrimon Trading ended 1 cent higher at $2.66, in trading 15,145 shares, Everything Fresh finished at $1.55, with 36,825 stock units changing hands, Elite Diagnostic settled 5 cents higher at $3.25, with 194,985 units passing through the market. 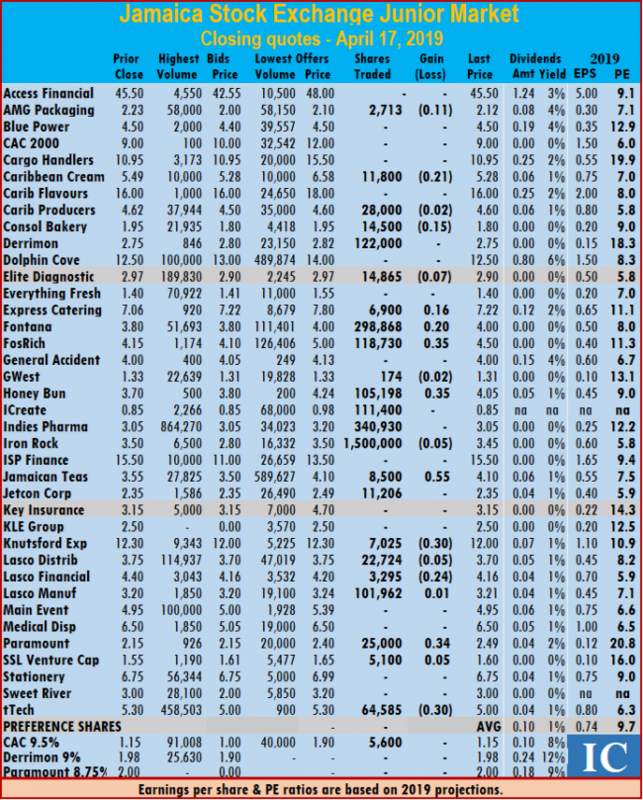 Express Catering ended trading 93,875 shares with a rise of 40 cents to $8, FosRich Group traded with 946,315 shares, with a loss of 20 cents to close at $4.30, Fontana finished trading with a loss of 4 cents at $3.97, with 28,700 shares crossing the exchange trading platform. General Accident closed at $4.50, with an exchange of 19,850 stock units, iCreate lost 1 cent and closed market activity at $1.01, with an exchange of 111,640 shares, Indies Pharma finished with a loss of 3 cents at $3.02, in trading 34,600 shares. 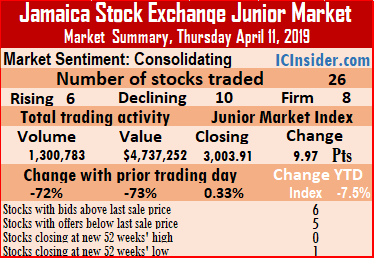 Iron Rock settled with a loss of 11 cents at $2.99, with 119,786 shares trading, Jamaican Teas traded 4,500 units, after rising 37 cents to $3.97, Jetcon Corporation climbed 37 cents higher to $3.24, with an exchange of 7,785 shares, KLE Group ended at $2.65, with 150 shares trading. 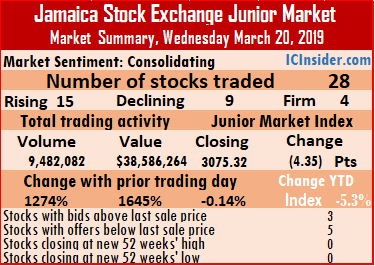 Lasco Distributors closed 4 cents higher at $3.80, with 97,950 units changing hands, Lasco Financial settled with a loss of 15 cents at $4.50, trading 68,459 shares, Lasco Manufacturing ended trading with 37,509 shares and lost 19 cents to close at $3.31, Main Event traded 42,586 shares at $5.50 and Stationery and Office concluded trading of 2,000 shares at $7.50. Trading climbed sharply on the Junior Market of the Jamaica Stock Exchange on Wednesday, ending in an exchange of 9,482,082 units valued at $38,586,264 compared to only 690,239 units valued at a mere $2,210,720, on Tuesday. At the close of trading, 28 securities changed hands, compared with 22 on Tuesday. The market index lost 4.35 points to close at 3,075.32 as the prices of 15 securities rose, 9 declined and 4 remained unchanged. Trading ended with an average of 338,646 units for an average of $1,378,081 in contrast to 31,375 units for an average of $100,487 on Tuesday. 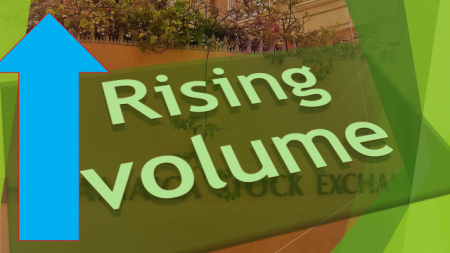 The average volume and value for the month to date amounts to 194,902 shares valued at $813,620 compared to 182,206 shares valued at $763,762 on the previous day. In contrast, February closed with average of 235,225 units valued at $679,790 for each security traded. IC bid-offer Indicator| At the end of trading, the Investor’s Choice bid-offer indicator reading shows 3 stocks ended with bids higher than their last selling prices and 5 with lower offers. 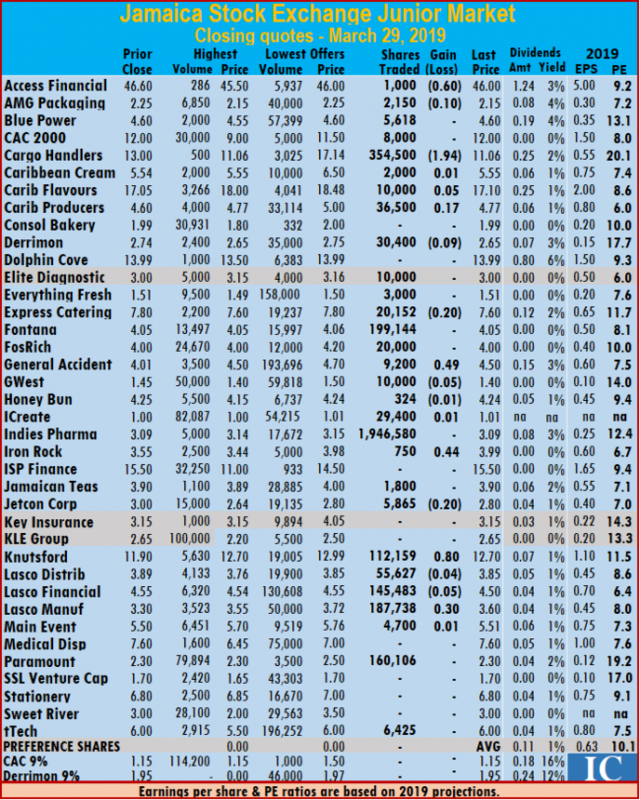 At the close of the market, AMG Packaging ended 2 cents higher at $2.10, with 542,000 stock units changing hands, Blue Power concluded trading of 49,000 units and rose 20 cents to close at $4.85, Cargo Handlers settled with a loss of 2 cents at $12.50, with an exchange of 300 shares. Caribbean Cream ended trading 1,350,100 shares and lost 43 cents to end at $5.52, Caribbean Flavours traded 2 cents higher at $17.22, with 100,000 stock units changing hands, Caribbean Producers swapped 2,477,187 units and fell 15 cents to close at $4.30, Consolidated Bakeries closed with a loss of 20 cents at $1.80, with an exchange of 2,500 shares. Derrimon Trading ended 1 cent higher at $2.81, with 3,520 shares trading, Dolphin Cove concluded trading of 110,100 units $13.99 after jumping by 49 cents, Everything Fresh concluded trading of 2,500 shares and rose 39 cents to $1.79. Express Catering settled at $7.80, with 200 units changing hands, FosRich Group ended trading 89,585 shares at 30 cents higher to $4.30, Fontana traded 8 cents higher at $4, with an exchange of 368,987 shares, Honey Bun ended with a loss of 10 cents at $3.70, with the trading of 30,000 units. iCreate closed market activity at $1.02, with an exchange of 95,836 shares, Indies Pharma concluded trading of 697,280 shares, 2 cents higher at $3.04, Iron Rock finished with a loss of 10 cents at $3, with 13,404 shares changing hands, Jamaican Teas ended trading 20,000 stock units with a loss of 40 cents to close at $3.60. Jetcon Corporation closed 7 cents higher at $2.87, with an exchange of 2,613,091 units. Knutsford Express ended at $12.50, in exchanging 14,412 shares, Lasco Distributors concluded trading of 22,243 stock units at $3.75, Lasco Financial finished 2 cents higher at $4.47, with 76,883 units trading, Lasco Manufacturing settled with a loss of 5 cents at $3.15, with 450,370 shares changing hands. Main Event ended trading with 5,940 shares and rose 1 cent to $5.31, Medical Disposables traded with a loss of 1.20 cents at $6.60, with 47,571 shares, Paramount Trading finished trading 106,618 stock units after rising 30 cents to close at $2.40, Stationery and Office ended 3 cents higher at $7.50, trading 148,545 shares and tTech finished 2 cents higher at $5.52, with 108,946 shares changing hands.